Boston, Massachusetts, U.S.A. — March 27, 2019 — Boris FX’s award-winning 2019 product line (Sapphire, Continuum, and Mocha Pro) adds significant creative visual effects tools with its upcoming releases (2019.5). Technology demos will debut at the National Association of Broadcasters (NAB), April 8-11, 2019 in Las Vegas, Nevada, Booth SL7620. Boris FX products support professional video applications including Adobe, Avid, Apple, Blackmagic Design, Autodesk, Foundry, Magix, FXHome, Grass Valley, Corel, and more. About Boris FX: Founded in 1995, Boris FX is a leading developer of VFX, compositing, titling, video editing, and workflow tools for broadcast, post-production, and film professionals. 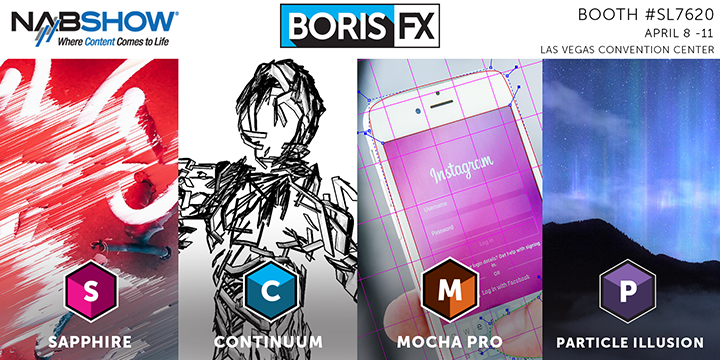 Boris FX products have grown to serve over a million artists worldwide. The company’s success lies in its ability to tightly integrate and leverage technologies through strong partnerships with Adobe, Apple, Avid, Blackmagic Design, Autodesk, FilmLight, Grass Valley, Magix, SGO, and other leading developers of video editing software. In 2014, Boris FX acquired Imagineer Systems, the Academy Award-winning developer of Mocha planar tracking software. In 2016, Boris FX acquired GenArts, the developer of Sapphire, the gold standard plug-in package for high-end visual effects.